Advisor Guide Accessible Pedestrian Station (AGPS) - J.O. Herbert Co., Inc. Regardless of physical capability, pedestrians are finding it more challenging to cross safely at signalized intersections. The Advisor APS provides important cues to assist all pedestrians to cross the intersection safely by providing audible, tactile, and visual indications at the crosswalk. A locator tone, controlled with ambient gain compensation, tells a pedestrian that the crossing is equipped with APS and where it can be found. An extended press provides specific intersection information and access to additional functions. 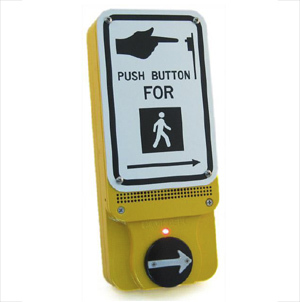 The audible walk tone or message is accompanied by a vibro-tactile indication during the visual walk display. Optional clearance phase indications may provide additional information to the pedestrian where appropriate.